Each May, CAL invites HMB High School Art Students to display their work, at no cost to the school or students. These are the emerging artists of the next generation. Art Dept. Chair, Sean Riordan, says the end-of-term exhibition is very important to the high school artists each year. HMB High School offers Sculpture classes as well as an AP Art Studio class. Elise Quick and Josh Warner-Carey with her piece "Plastic." What is the Nature of Inspiration? 5 artists - two sculptors, a potter, and 2 photographers challenged themselves with twenty inspirational themes, without seeing one another's work until completed. 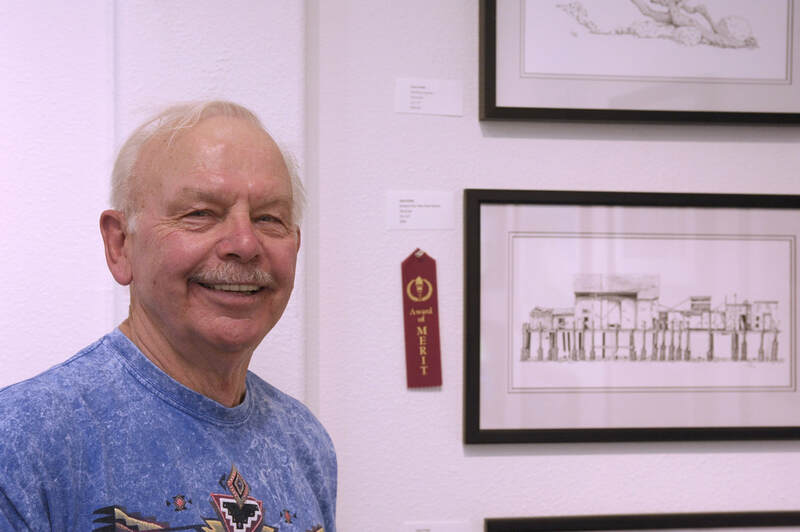 Gary Frink won for his pen and ink rendition of Romeo Pier. 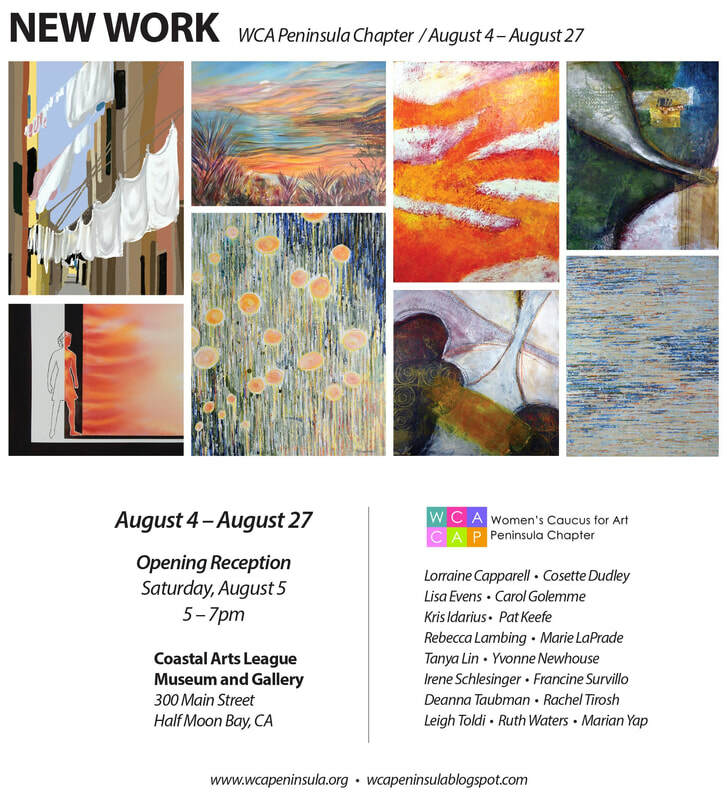 This show featured artworks that celebrate the ordinary and astounding beauty of the California coast, from the deep water to the bluffs. 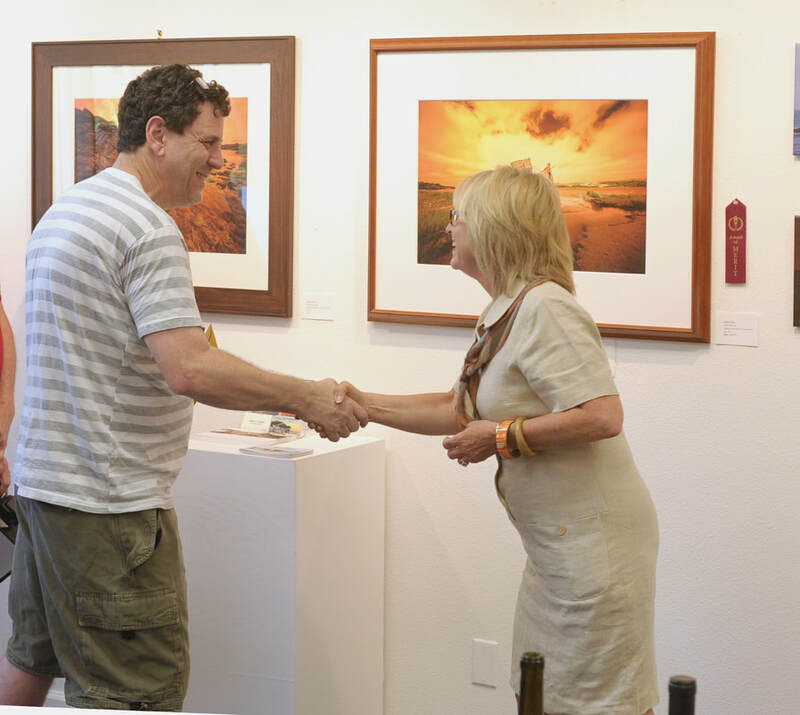 Juror, Barbara Masek, congratulates Robert Zucker on his photograph. 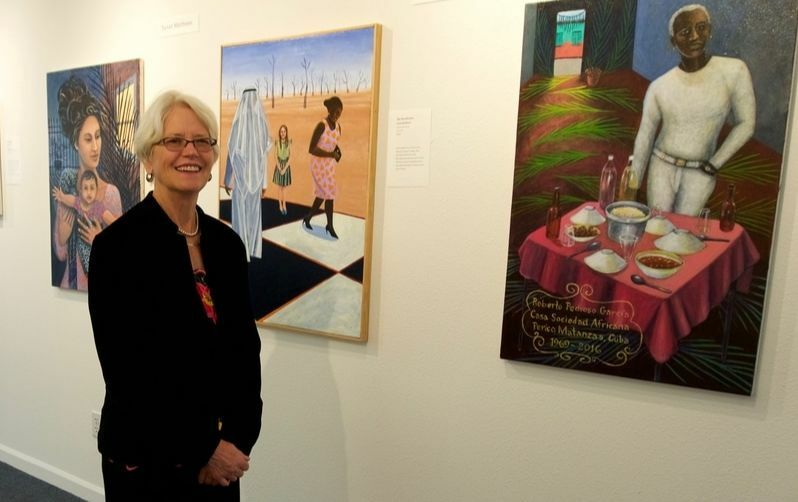 Artist Sue Matthews at the Opening, with her entries. Eric Greenhut's Plein Air Painter Club filled the gallery with images of the Coastside. Always a popular show, Eric's weekly painting classes elicit growth among participating artists. The 3 artists, working under the name Painted Memories, filled the gallery with 99 oil paintings of California scenes. 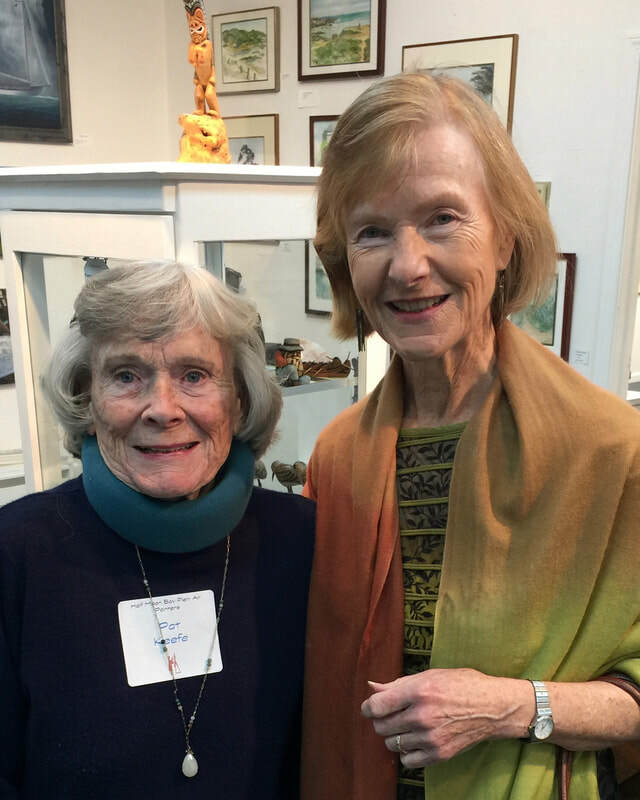 Sponsored in part by the Coastal Arts League and businesses in the community, 20% of art sales and 100% of door donations were contributed to the Alzheimer's Association's June fundraiser, comprising some 160 teams across Northern California and Nevada. 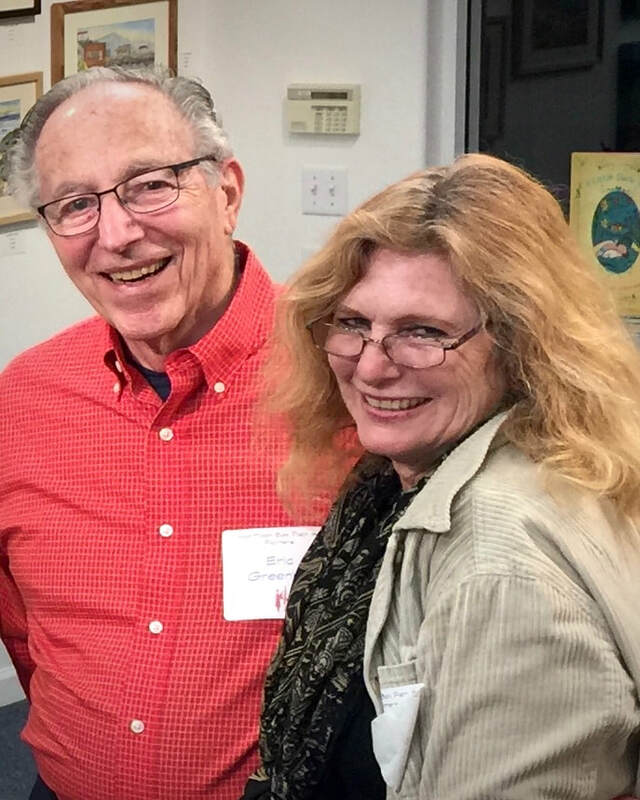 Together, Al Shamble, Susan McInnes, and Mark Monsarrat raised several thousand for the Association. Mark Monsarrat captures our sign. Dr. Sue MacInnes paints Main Street to promote the Benefit Show. “Three strangers are sharing gallery space for three weeks,” said Don Baldwin in an email. “We could have divvied up the gallery space into thirds and presented three compartmented exhibitions, but, upon meeting each other, we quickly decided that the only way to proceed was by interweaving our respective artworks into one exhibition. “It is a fresh example of the power of art to unite people, and another incentive to fund art education in our schools,” he added. Paul Rubas, sculptor, was born in the Czech Republic. Attended Rutgers University majoring in languages and literature. He is a self-taught artist who resides in Belmont. His sculptures and furniture are made from recycled and reshaped materials, including metals, various woods and stone. Steve Renwick, photographer, grew up in Maine and was educated as a physicist in Connecticut. He drifted into the semiconductor industry and was lured to the late-20th-century Gold Dot Com Rush in California in 2000. He and his wife each work "up over the hill" but live in Moss Beach, enjoying the Coastside community. Denis Rauchman shared insights about pottery making. Curator, Jeff Klagenberg, discussed the artist's work.